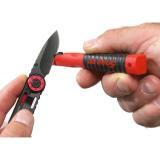 Snap-On Carbide Knife Sharpener sharpens all knife blades in 4-5 strokes. 4" in length, this sharpener features a pocket clip and replaceable carbide blades. Snap the storage cap over the sharpener and clip it to a pocket, toss it in a drawer or hang it on pegboard. Simple and effective.